What’s more immersive than surround sound? An audio system that can use the third dimension of height. Have you ever seen a presentation explaining the difference between the second and third dimensions? If you were to step into a 2D world, it would be like living inside a piece of paper—an entire universe completely flat in its existence. Objects could exist only on a single plane, left, right, straight ahead, or behind. In mathematical terms, you would have only an X axis and a Y axis. In a 2D world, the concepts of “up” or “down” do not exist. There is no Z axis. Jump back over to the third dimension and you’ll encounter an entire world of sights and sounds above and below in addition to all around. Step into a 3D world and you’ll immediately feel as though things are more realistic, more natural, more true-to-life. Imagine how difficult it would be to explain to a person living in a 2D world what the 3D world looks like, feels like, and sounds like. Simplified representations of two-dimensional and three-dimensional spaces. 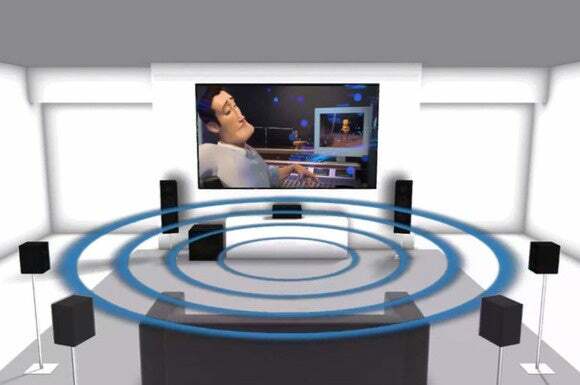 But when it comes to home theater audio, we’ve been living in a 2D world all along. Traditional 5.1- and 7.1-channel audio setups surround you, but they surround you on a single plane. A 5.1-channel system has three speakers in front, right, left, and center; left and right surround speakers; and a subwoofer for low-frequency effects. A 7.1-channel system adds left and right speakers behind you. So you’re surrounded by speakers, but they’re all on a flat plane. We’ve never known anything different because that’s all that’s been available to us. Update: We've added a terrific video from Dolby Labs with a behind-the-scenes look at how Mad Max: Fury Road was remastered with Dolby Atmos for the home theater. What’s more, the audio for movies and music has always been mastered for 2D presentations only. Fidelity and resolution has increased over the years, but recording engineers have never had the tools to deliver a truly three-dimensional audio experience in which sounds come from above you as well as around you. Sure, you could mount speakers high on the wall or even in the ceiling, but your playback equipment had no way of taking those placements into consideration. Conventional surround-sound systems, such as this 7.1-channel setup, operate on a single horizontal plane. The need for a truly immersive audio solution hasn’t been lost on the industry. The two most notable names in multichannel audio, Dolby Labs and DTS, have been working hard to tackle this problem and transform 2D sound into an immersive, 3D audio experience. After many years of research, both companies have finally unveiled their immersive audio solutions: Dolby launched Dolby Atmos and DTS released DTS:X. 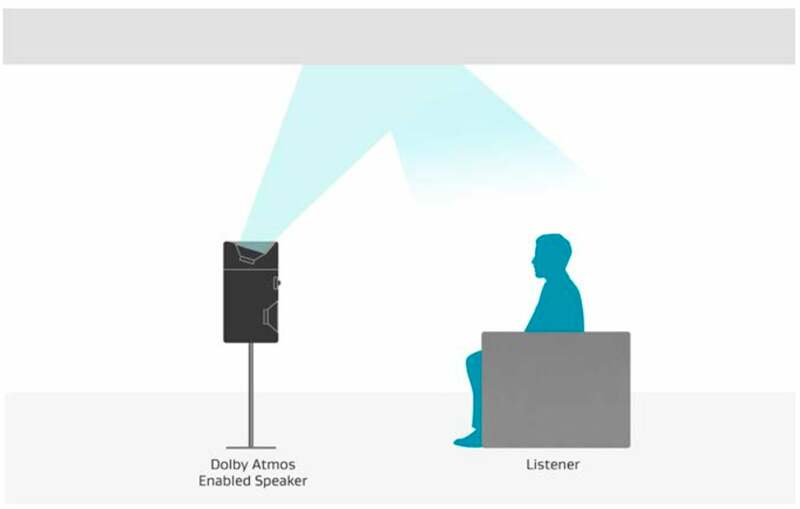 Both Dolby Atmos and DTS:X are object-based audio formats. Unlike traditional audio mixing, which associates a sound with a particular speaker on a 2D plane, object-based audio technology treats each sound (the roar of an airplane, bullets flying through the air, raindrops hitting leaves, birds chirping, and so on) as an individual object. When sound is treated as an object, it becomes a real game-changer. Each sound object is accompanied by descriptive information—metadata—that describes aspects of that sound, such as where the sound object is located in a room, or in what direction the sound should move along the sound field and at what speed. The decoder in your A/V receiver assembles this information from the source—such as Blu-ray player or home-theater PC—and calculates which combination of speakers should work together to reproduce that sound in your room. This is a really big deal for home theater’s future. Here’s how each company is approaching object-based sound. Dolby Labs was first out of the gate with Dolby Atmos. This immersive audio technology was implemented in select commercial cinemas in 2012. The theaters installed new arrays of overhead speakers for the debut of Pixar’s animated feature film Brave, which earned critical acclaim for the way it made you feel like you were in a space as part of the movie. Dolby brought Atmos to home theaters two years later. 'Mad Max: Fury Road' Dolby Atmos home theater mix from Dolby Laboratories on Vimeo. To implement Dolby Atmos in your home theater, you’ll need an A/V receiver and one or two pairs of loudspeakers in your ceiling (yes, there are alternatives to ceiling speakers, I’ll discuss them in a moment). This will deliver the sensation of height to create a spherical, 3D sound experience. The ideal Atmos setup consists of one pair of in-ceiling height speakers in front of the listening position and a second pair of in-ceiling height speakers behind the listening position. To get the best Dolby Atmos experience, you'll need two ceiling speakers at the front of the room and a second pair in the back of the room. As with other Dolby surround-sound setups, these height speaker placements are pre-defined. 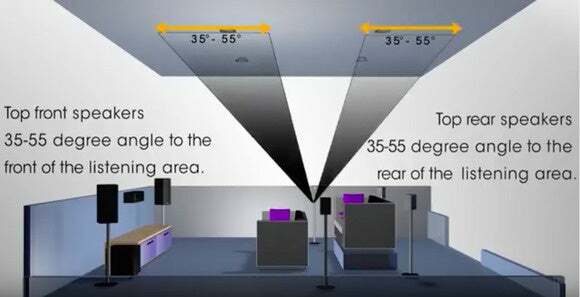 Height speakers are in line with your front left and right speakers and are at a specified angle from the primary listening position: Between 30- and 50 degrees for the front, and 125- to 150 degrees for the rear). If you can’t install the optimal configuration of two pairs of in-ceiling speakers, Dolby has outlined a few alternatives. 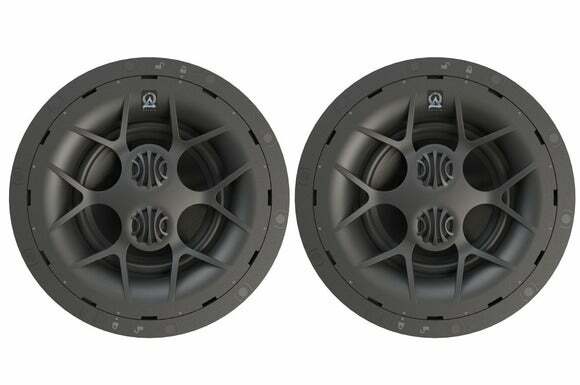 The first is to install an entry-level Atmos system that consists of only a single pair of height speakers in front of the primary listening position. While Atmos specifies in-ceiling speakers, Dolby realizes that some people won’t be able to install them (concrete walls or ceilings, multi-story homes, and so on). So the company developed specifications for an upward-firing Atmos speaker that can mimic the effect of an in-ceiling speaker. An Atmos speaker is a separate, upward-firing speaker that sits on top of your existing front left and right and rear left and right speakers. There are also special Atmos speakers coming to market that have both traditional forward-firing audio drivers as well as upward-firing drivers in a single cabinet. One alternative to installing ceiling speakers is to have speakers that can project sound upward and reflect it off your ceiling. In-ceiling speakers are the preferred solution; but if you must consider upward-firing Atmos speakers, you should be aware of these technical restrictions: For this trick to work, Dolby says that you need a completely flat and reflective ceiling that is made of either plaster or sheetrock. The ceiling must be between 7.5 and 14 feet high, so tall cathedral ceilings, tiled ceilings, or angled ceilings won’t work. In theory, with the right kind of ceiling, the upward-firing speaker will project the height channel information off the ceiling and back down to the listener. This is a good alternative, but it is a compromise—it won’t be as effective as a discrete in-ceiling speaker installation when it comes to the magic of three-dimensional, immersive audio. Not to be outdone by its rival, DTS launched its competing technology for immersive audio: DTS:X. DTS:X is in many ways very similar to Dolby Atmos in that both technologies create an immersive three-dimensional sound stage through the addition of overhead speakers; they both treat sounds as objects with metadata describing those sound objects; and they both render those sounds along a three-dimensional axis. 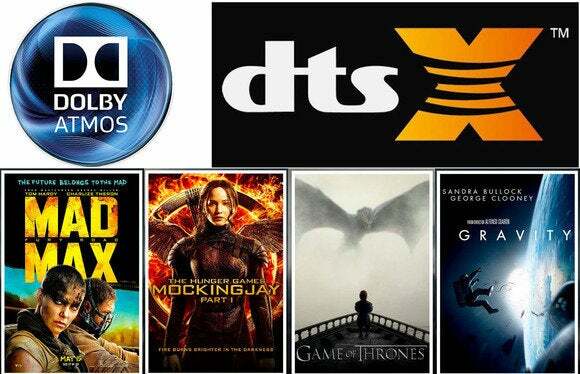 There are nonetheless a number of key factors that differentiate DTS:X from Dolby Atmos, and those differences could be tremendously advantageous to many consumers. Where Atmos defines fixed locations for speakers, DTS maintains that DTS:X is location agnostic. In other words, DTS says you can arrange your home theater system speakers any way you’d like. DTS hasn’t divulged exactly how new DTS systems will figure this out, but I’m guessing you’d need a new receiver with a special microphone capable of identifying exact speaker locations, not just calculating the speakers’ distances from your listening position. A pair of Origin Audio D60DT in-ceiling speakers (note the dual tweeters on these 6.5-inch models). I also doubt that you’ll have complete flexibility to put speakers absolutely wherever you want. You always want to aim for optimal speaker placement to minimize the amount of digital signal processing you’re subjecting the audio stream to. Optimal speaker placement in relation to your listening position will always result in the best audio performance. Even DTS’ own DTS:X demos have consisted of relatively fixed and symmetrical speaker placement in a spherical arrangement. DTS:X should be considered as backward-compatible with existing 5.1 and 7.1 systems, but having a bit more flexibility in speaker placement. If you haven’t be able to use as many speakers as you’d like due to visual aesthetics or awkward room layout, DTS:X might allow you to make use of those speakers in unconventional locations. Pioneer's Elite-series SP-EF S73 tower speakers have upward-firing speakers at the top of their cabinets. Perhaps more importantly, it looks as though DTS:X will be capable of leveraging a Dolby Atmos speaker layout so that you can support both formats with a single speaker layout. What remains unclear, however, is if DTS:X will also be able to take advantage of upward-firing Atmos speakers in the event that you can’t install in-ceiling speakers. Another feature unique to DTS:X is its ability to customize your listening experience. If you’re watching a movie and having difficulty understanding the dialog, DTS:X will allow you to adjust just that element of the soundtrack, so that you can hear it more clearly. You can achieve something similar with today’s receivers by boosting the volume of the center channel, but that boosts everything in the center channel, not just the dialog. So this feature could be a pretty big deal. 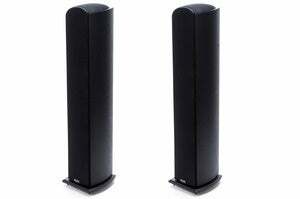 We’ve already discussed the need for one or more pairs of overhead height speakers to take advantage of Dolby Atmos or DTS:X. That’s not the only hardware you’ll need. We have some good news and bad news on that front. Let’s start with the bad news. To be able to take full advantage of Dolby Atmos or DTS:X, you’ll need a new A/V receiver. Unless it’s very recent (some recent models were labeled “Dolby Atmos ready” when they shipped and needed just a firmware update), your existing model won’t have the signal-processing chops or amplifier power to drive those extra speakers. Denon's flagship A/V receiver, the AVR-7200WA, is capable of driving 7 surround speakers, 4 height speakers, and a subwoofer. When you shop for a new Atmos and DTS:X compatible receiver, pay special attention to which speaker configurations the receiver supports. Generally speaking, entry-level receivers will support the minimum number of immersive channels while more expensive receivers will support more speakers. You can identify the number of speakers in an object-based surround-sound system from a third digit. An entry-level system with five speakers and a subwoofer is described as a 5.1-channel system, so an entry-level object-based sound system with two additional height speakers is described as a 5.1.2-channel system. Add two more height speakers, and you have a 5.1.4-channel system. Add a second subwoofer to that and you have a 5.2.4-channel system, and so on. The number of channels you can put in your home theater is limited only by space and your budget for amplifiers and speakers. Speaking of budgets, most entry-level A/V receivers supporting Dolby Atmos or DTS:X will start around at $500 (but they probably won't support both). Receivers in the $600 to $1500 will support either a 5.1.2 configuration with two height channels (the Atmos height minimum) or a 5.1.4 configuration with four height channels (the Atmos spec supports more height channels, but A/V receiver manufacturers aren’t ready to go there yet). More expensive receivers—in the $1500 to $3000+ range—will support 7.1.4- or even 9.1.4-channel configurations. A 9.1.4-channel configuration isn’t necessary for most home theaters, as it adds width speakers to support very large rooms. Onkyo's TX-NR737 will be easier on your budget, but it supports only Dolby Atmos with up 5 surround speakers plus a subwoofer. Because there’s a practical limit to the number of amplification channels a receiver can house in its chassis (most max out at 9), some of those higher-end models will give you the option of adding an external power amplifier to drive additional speaker channels (via pre-amp outputs). So make sure the receiver you’re considering supports the maximum number of channels you want in your home theater now and in the future. In order to enjoy Atmos and DTS:X, you’ll need Blu-ray movie discs with soundtracks that have been encoded using Atmos or DTS:X. Yes, that could mean repurchasing the same movies you already paid for; but let’s face it, Hollywood wouldn’t bother doing this if there wasn’t money to be made. At least you’re getting a new and better experience. Anyway, that list of movies is very small right now. It will grow over time. While you’re waiting, that new Dolby Atmos/DTS:X A/V receiver is outfitted with up-mixing technology that will convert the existing 2D soundtrack into pseudo-3D. It won’t be as good as the real thing, but the implementation is pretty darn good; it will give you some extra mileage from your existing Blu-ray collection. One thing you won’t need is a new Blu-ray player (unless you want to move up to 4K Blu-ray 4K, that is). As long as your existing Blu-ray player conforms to the Blu-ray spec, it will be capable of sending Dolby Atmos and DTS:X soundtracks to your A/V receiver for decoding. The player, however, must be configured to send audio over HDMI as a bitstream and not as PCM (pulse-code modulation). Double-check the player’s settings to be sure that’s the case (this is also required for Blu-ray’s older Dolby TrueHD and DTS-HD Master Audio codecs). It’s early days for Dolby Atmos and DTS:X, but these new technologies deliver exciting, immersive audio performances that are exciting and more realistic than anything that’s preceded them. You’ll need a new receiver to get them, and most people will need to add at least a couple of speakers, but the experience will be well worth the investment.